← Unexpected new cabinet proposed for Lower Greenfield – a gift horse? We have been told for over a year that the public subsidy to BT for modern broadband wouldn’t come to the Connect8 area. In many meetings, phone calls, chats, emails etc it has been made clear that our patch is not a priority, is difficult to reach and has too low a population density to fund from the public purse. Only Christmas Common would get a new cabinet and even that was in doubt. Now it seems that has changed. In the last few days we have started to get sight of substantial Oxfordshire County Council, SODC, BT, central government and other investment coming to the area. This first manifested itself in the planning notification for the unheralded Lower Greenfield Cabinet. 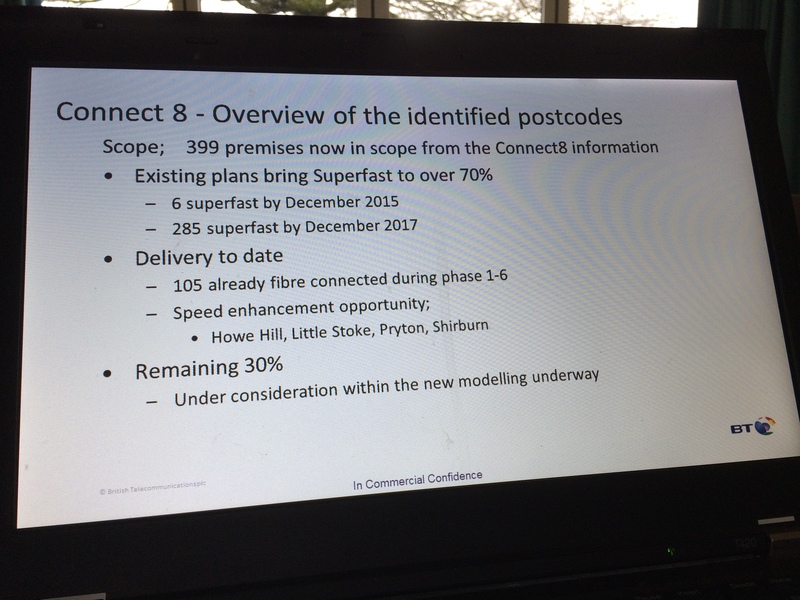 Further enquiries with OCC and a meeting with BT have revealed a partially worked up plan to bring modern broadband to about 70% of the houses in the postcodes covered by Connect8. See the BT slide above – there is some confusion over postcodes/place names – we have handed over a better list and await a response. We are now seeing other planning notices coming in, even in the Stonor Valley, over near Nuffield/Park Corner etc. OCC inform us that substantial savings have been found in the so-called Phase1 rollout and Phase2 planning and this money can be deployed now. And the Connect8 patch is now a priority. BT Openreach are now in full flow planning where to deploy cabinets and other infrastructure to serve superfast broadband down phone lines at a cost (to the public purse and BT) of about £1,100 per house. This is estimated to reach 70% of the postcodes/houses in our patch by end 2017. That last 30% will be too expensive to reach on current plans – for instance just too far even from the new cabinets or with knackered phone lines. There are important caveats to this – we won’t know the speeds people can get until the infrastructure is in. Also we won’t know who is in the 70% and who isn’t for a while nor quite where they see the boundaries of our patch. The (woeful) postcode checker on the Better Broadband for Oxfordshire site reflects this plan, but don’t go looking for cabinet details on the corresponding cabinet map for a while. BT say they should have a detailed plan, still with caveats by June and we have invited them to address a Connect8 community meeting them (they have accepted). There might be an outline plan in March, but with heavy caveats. One can’t read too much at present into the plans coming in for cabinets – the phasing of the BDUK and BT planning process is quite complicated and it won’t make sense on the ground for a while. Also we don’t know how budget will be allocated when the inevitable engineering problems are hit installing/clearing ducting, actually testing, making sure the existing lines are fit for purpose etc etc. What will be done if these issue push a particular piece of kit over budget etc etc. does that post code just get chopped. So don’t count on anything at all until you are sitting at home online at 25Mb/s. Overall this is undoubtedly good news for those who end up being ‘in’ and eventually connected at superfast speeds, whoever/whenever you are. We have gone from probably 10% getting superfast from BT to a theoretical 70%. We don’t know whether this is as a result of our campaigning, the kindness of politicians and bureaucrats or the threat of a credible competing infrastructure to BT via the Village Networks proposal of December 2015. The BT and OCC officers we have spoken to were sincere, helpful and in good faith. But I can’t quite get to the bottom of it yet. Even I am not deeply cynical enough to think that the imminent visit of Parliament’s Select Committee can drive such action, before anyone suggests it. We shall still carry on however with the Village Networks scheme – which, if we can get over some technical snags will deliver faster and provides insurance for those of us who aren’t confident in the down the phone wire technology working for their property. We have discussed all the above with Village Networks and they are happy still to proceed. More as we get it, as they say. This entry was posted in Britwell Hill, Britwell Salome, Christmas Common, Cookley Green, Cuxham, Greenfield, Howe Hill, Little Stoke, Maidensgrove, Northend, Park Corner, Pishill with Stonor, Pyrton, Russells Water, Swyncombe, Turville Heath and tagged bduk, BT, dsl, occ, openreach. Bookmark the permalink. Hi. Can we add RG9 6LQ – Northend to the list of postcodes being looked at? Sure which bit of north end is that? Hi. It is the Oxfordshire end, near Christmas Common. …and also OX49 5HP being Hollandridge Farm. Thanks. RG96EU is not listed though it is the heart of Russells Water by the village green. Is there any more information on this please? Please could RG9 6HF, which covers Stonor Park, also be added. Also please note that a previous tenant of the offices at Stonor laid fibre from (we believe) Henley-on-Thames to the offices. Could this be of wider help? Also we hope that this could be connected to the new planned green box in Stonor to avoid having to use the copper lines into Stonor Park.